There were thirteen fatalities in Washington, DC Monday morning following an armed rampage at Navy Yard, including the gunman later identified as Aaron Alexis. 0139 GMT: The same government contractor that deemed NSA whistleblower Edward Snowden eligible for a security clearance also screened Aaron Alexis, the accused gunman behind the Navy Yard shooting. USIS admitted Thursday that it had conducted checks on Alexis in 2007 and granted him security clearance in 2008. The privilege was good until 2018. A spokesman refused to tell reporters exactly what the vetting process turned up on Alexis but did reveal that his 204 arrest was noted. US Senator Claire McCaskill said after Snowden leaked classified NSA documents earlier this year that USIS would be the subject of a criminal investigation for a “pattern of failure.” USIS is one of the primary companies used by the US government to conduct such security checks. 2030 GMT: Navy Yard gunman Aaron Alexis is believed to have carried out Monday’s shootings without any specific targets in mind, according to comments made by FBI Director James Comey. 1500 GMT: Washington Navy Yard reopened on Thursday morning at 6am, with all facilities functioning and accessible with the exception of Building 197 and a gym, which were the site of Monday’s shootings. The base remained at a heightened level of security, while a notice posted online stated that Building 197 and surrounding areas “remain an active crime scene" and will be closed until further notice. A letter from Vice Admiral Bill French to staff said Thursday was a "regular workday." "I join with you in grieving for our Navy Yard colleagues and Navy family who were senselessly gunned down on Monday. But as we grieve, we also stand strong, knowing that our inner strength and the ideals for which we work and train and fight are infinitely stronger than gun-wielding individuals." 2230 GMT: Sources within the Capitol Police department have told the BBC that the heavily armed and highly trained four-member Containment and Emergency Response Team (Cert) arrived outside one of the Navy Yard buildings armed with HK-416 assault weapons a few minutes after the 8:20am initial report, but were told to stand down by a supervisor instead of aiding municipal officers. "I don't think it's a far stretch to say that some lives may have been saved if we were allowed to intervene," a Capitol Police source familiar with the incident told the BBC. The department has launched a review into the matter. 2200 GMT: The Washington Navy Yard gunman had recently been to two different hospitals seeking treatment for insomnia, though he denied having any anxiety or depression issues, or thoughts of harming himself or others, reports the AP. The new information regarding visits by Alexis to two different VA hospitals in August -- one in Rhode Island, and the other in Washington -- was released to Congress on Wednesday. Alexis was prescribed medication to help him sleep, though medical records described him as “alert and oriented” during hospital visits. Alexis, formerly a member of the Navy Reserve, had a 30 per cent “disability rating” based on orthopedic issues and tinnitus, a hearing condition that can produce ringing when no sound is present. 2100 GMT: Two law enforcement officials have said that Alexis carved phrases onto the stock of his shotgun prior to the mass shooting that read “Better off this way” and “My ELF weapon.” Investigators are looking at those carvings as potential clues as to the gunman’s motives. ELF typically refers to “extremely low frequency” says the Washington Post, and may be related to prior claims made by Alexis that vibrations were being aimed at him by unknown individuals. 0332 GMT: US Senators Claire McCaskill and Jon Tester will send a letter to the inspector general of the Office of Personnel Management (OPM), seeking answers surrounding the suspect’s background check that led to the clearance. OPM handles oversight of most federal background checks. 2230 GMT: New information regarding an August 7 incident in Rhode Island involving Aaron Alexis adds to mounting evidence suggesting the gunman was mentally unstable. According to a report filed by Newport police sent to the Rhode Island naval station Alexis was involved in an argument with another individual prior to boarding a flight originating in Virginia. Alexis later said he believed that individual had sent three other people to follow and harass him, reports the AP. Alexis heard voices speaking to him through a wall at a hotel in Rhode Island, leading him to change hotels twice, though the voices still followed him and he feared they would harm him. According to the police report Alexis believed the individuals trailing him were using “some sort of microwave machine” to emit vibrations through the ceiling, penetrating his body and preventing him from falling asleep. 2100 GMT: An attorney for a Virginia gun store has confirmed that Alexis rented a rifle, purchased bullets and used a shooting range at Sharpshooters Small Arms Range on Saturday (the AP had previously reported that had taken place on Sunday), some 15 miles from the site of the shootings at the Navy Yard. Michael Slocum said via an email to the AP that Alexis had purchased a shotgun along with 24 shells. Slocum added that the gun store had processed a federal background check and that it had been approved. Law enforcement showed up at the range on Monday and reviewed video and store records. 1910 GMT: US Secretary of Defense Chuck Hagel is to order a report on American military installations around the world as a response to Monday’s mass shootings at the DC Navy Yard. A senior Pentagon official has said that Hagel will work with senior officials to create a process for a review, which may be formally announced as early as tomorrow, reports The Hill newspaper. That report should be similar to that already announced by the US Navy. 1918 GMT: An IT company that Aaron Alexis worked for told Reuters that they hired an outside firm to perform two background checks on the suspected shooter within the last year, and twice confirmed his “secret”-level security clearance as authorized by the Pentagon. "The latest background check and security clearance confirmation were in late June of 2013 and revealed no issues other than one minor traffic violation," Alexis' employer, The Experts, told Reuters. 1809 GMT: At a press conference at Navy Yard Tuesday afternoon, the FBI said they do not have any information at this time to suggest that Alexis had an AR-15 in his possession during Monday's rampage. A representative for the agency cautioned the media against reporting inaccurate information from illegitimate sources and said the FBI believes Alexis entered Navy Yard with a shotgun and may have obtained a handgun after he opened fire at Building 197. 1700 GMT: Following the shooting, US Navy Secretary Ray Mabus ordered a review of physical security at all Navy and Marine Corps installations, Reuters reports. First, the Navy will take a "quick look" at installations to see whether existing physical security standards are being met. Then, a second review will be larger and more in-depth, the official said. 1355 GMT: Suspected Navy Yard shooter, Aaron Alexis, was honorably discharged from the US Navy reserve in 2011 despite a pattern of misconduct, Reuters reports citing an official. 1120 GMT: Defense Secretary Chuck Hagel will lay a wreath in honor of the victims, CNN reports. 0240 GMT: The Metropolitan police have released the names of seven people who were killed Monday. Scott Williams, the police officer who was shot, is a 20-year veteran of the force and is said to be "in high spirits" after surgery. 0219 GMT: Washington Mayor Gray told reporters that the deceased victims were all between 46 and 73 years of age. The authorities are still notifying families and they are unsure of when that process will be complete. He added that a total of eight people were injured. Three of that total were shot, including the policeman shot three times in the leg. Another five injuries were less serious, ranging from stress and chest pain to head contusions. Police said residents can travel through the city freely again, as there has been no evidence of a second shooter. At least one of the victims was a Washington DC resident and no active-duty military have been identified as killed or wounded. The FBI has determined that Alexis had "legitimate access" to the Navy Yard. Gray also anticipated that traffic patterns will returns to normal throughout the DC metro area on Tuesday. 0154 GMT: Pentagon officials said the Navy has decided to wait 24 hours before releasing the victims' identities. 0131 GMT: Vice Admiral French told reporters that, as of 8:30 pm EST, approximately 2,000 civilians were still at the Navy Yard and it was likely that it may take three hours to process them off the base. SWAT teams swept the site clearing people out of hiding spots area-by-area. A city official told the Washington Post one Navy employee was found in a locker after hiding there for 11 hours. 0129 GMT: The shooter carried an AR-15 assault rifle, a shotgun, and a handgun during Monday’s rampage. Authorities believe he arrived at the Navy Yard with a shotgun and obtained the Ar-15 and handgun from a safe at the military site. 0111 GMT: Alexis had a “secret” security clearance and had a military-ID card, although whether he started work at the Navy Yard yet remains unclear. “He did have a secret clearance. And he did have a CAC (common access card),” Thomas Hoshko, CEO of “The Experts,” the firm contracted by the Navy, told Reuters. 0027 GMT: California Senator Dianne Feinstein said in a statement Monday that the Navy Yard shooting is just further evidence that Congress is "skirting its responsibility" to make automatic weapons illegal for criminals to purchase. 0024 GMT: Navy Vice Admiral William French told reporters that a total of 13 people were killed in the shooting, including the shooter, and all victims were civilians. Fourteen others were wounded. "Our hearts, our thoughts, and prayers go out to everyone involved," French said. 0013 GMT: Free counseling will be available for military personnel and civilian personnel affected by the shooting Monday. Transportation will also be provided for the families of those affected if they choose to attend counseling at the Washington Nationals baseball park, a law enforcement spokesman said during an evening press conference. 0004 GMT: Alexis security clearance was updated in July and approved by military personnel. He appears to have had a government access security card that would have allowed him entry into the Navy Yard and other military facilities. 0003 GMT: The Washington Navy Yard, where an armed gunman killed 12 people Monday after reportedly gaining entry with an ID badge, has a history of faulty surveillance. Sources told McClatchy newspapers that Building 197 in particular has poor entrance controls, areas cameras are unable to view, insufficient lighting, a faulty alarm system, and other problems. James Atkinson, a former military intelligence officer who is now the chief of Granite Island Group, a Massachusetts surveillance firm, said his company found a number of issues during a recent inspection. Granite Island Group held a “controlled penetration” test that revealed a sensor was not working, in part because screws from a hardware store were in place were more expensive screws were necessary. “We found not only that people opened it up, but there were traces that somebody had placed a device inside that was recording data, so somebody could hoax the unit and claim to be a person they were not,” Atkinson told McClatchy. 2337 GMT: Monday’s shooting represents the single-worst loss of life in Washington DC since an airliner crashed into the Potomac River in 1982, according to the Washington Post. 2328 GMT: Moderators on the social news website Reddit banned a sub-section that encouraged users to help identify the Navy Yard shooter. Reddit came under harsh criticism earlier this year when users misidentified the Boston Marathon bomber as a missing college student who had committed suicide before the terrorist attack. 2313 GMT: The FBI has ruled out the involvement of any other shooters but is still "seeking one person" in connection with the shooting, according to CNN. 2307 GMT: A Hewlett Packard spokesman said Alexis worked for the company as a contractor, with duties to "refresh equipment used on the Navy Marine Corps Intranet (NMCI) network." He was officially employed by a company called "The Experts," per Ryan Ruggiero of CNBC. 2300 GMT: Pete Williams of NBC News reported Alexis may have lost his job as a civilian contractor in the Navy's technology area and been motivated by a "grudge" against the Navy. Aaron Alexis had history of shootings, anger management; discharged from Navy for "pattern of misconduct." Yet hired as defense contractor. 2252 GMT: Alexis was enrolled as a student at Embry-Riddle Aeronautical University, a spokesperson told The Washington Post. It is unknown what degree he was pursuing but the spokeswoman described Alexis as a student "in good standing." 2245 GMT: The White House has been locked down in a security alert. The Secret Service told multiple media outlets that firecrackers were thrown over the fence and that gunshots were not fired. This incident does not initially appear to be related to the Navy Yard shooting. 2222GMT: Authorities say they still have yet to determine a motive, stressing that the investigation is ongoing. Both the FBI and NYPD have interviewed Alexis' family at their home in Brooklyn, according to WNBC in New York. They say there is no evidence indicating the shooting was a terrorist attack. 2216 GMT: Police Chief Cathy Lanier said during an afternoon press conference that authorities are still trying to determine whether a second gunman was involved in the shooting. If so, she added, that individual is still at large. A spokeswoman from MedStar Hospital Center said all of the injured are expected to survive. One police officer was among the wounded, suffering injuries from "bones and blood vessels in his leg" and was in surgery Monday afternoon. 2201 GMT: Alexis was arrested In Seattle, Washington in 2004 for what police described as an “anger-fueled” shooting. He was taken into custody for shooting out the tires of another man’s vehicle and later told officers he was “mocked” by construction workers who “disrespected him.” Alexis said he was in a “blackout” rage and could not recall shooting, as quoted by The Guardian. 2149 GMT: Alexis was a practicing Buddhist known to meditate twice a week at the Wat Busayadhammavanaram Meditation Center, although at least one other visitor came to be wary of Alexis because of his attitude. “He would help people if they came in carrying heavy things,” J. Sirun, an assistant to the monks at the center, told the Washington Post. “From the outside, he was a quiet person. But on the inside, I think he was very aggressive. He did not like to be close with anybody, like a soldier who has been at war. 2139 GMT: US President Obama has ordered that all American flags at the White House, all public buildings, as well as United States embassies, legations, consular offices, and other facilities abroad be lowered to half staff until September 20 in honor of Monday's victims. 2132 GMT: The FBI has released photos of Alexis and asked the public for any information on the now-deceased shooter. Authorities said during a press conference Monday afternoon that "no amount of information is too small." The restaurant owner seemed to be surprised and saddened upon learning Alexis was killed in a shootout with police, “‘Wait, he’s dead? I call him, but he doesn’t answer phone," he said. 2103 GMT: The Navy said in a statement that Alexis served as a full-time reservist from 2007 until January 31, 2011. He worked for the “fleet logistics support squadron No. 46 in Fort Worth, Texas,” although his home of record was New York City. Multiple media outlets have speculated that his exit was related to a gun-related arrest in 2010 but the Navy confirmed that he was released on a "general discharge" related to multiple misconduct incidents. He was awarded the National Defense Service Medal and the Global War on Terrorism Service Medal despite never serving overseas, according to The Guardian's Spencer Ackerman. 2052 GMT: Sandy Guerra-Cline, a copy editor at the Fort Worth Star-Telegram, said in a video posted Monday that she remembered Aaron Alexis from when the accused shooter worked at a local Thai restaurant. She described it as a Mom and Pop restaurant and Alexis, who moved to the region with the military, as a "sweet" and "intelligent" waiter who was attempting to learn Thai in his free time. 2030 GMT: Mayor Gray said, “We don’t know if there is a second gunman on the loose.” Police are looking for a second person of interest. 2021 GMT: Thirteen people have now died in the shooting, DC Mayor Gray said at a Monday afternoon press conference. “I don’t know if we can even remember something quite like this here in the city,” Mayor Gray said. Gray said that authorities are still looking for a second suspected shooter, a black man around 50 years old last seen in a drab olive uniform. Officials are no longer looking for a third person of interest. The mayor added that there is “No reason at this stage to suspect terrorism,” but said the possibility has not been ruled out. 2003 GMT: Janis Orlowski, chief medical officer at Washington Hospital Center, said the three victims brought in earlier today are expected to make full recoveries. 1931 GMT: “In light of the uncertainty surrounding the shooting at the Navy Yard this morning and particularly the possibility of suspects remaining at-large, we have decided to shelter-in-place for the Senate complex,” US Senate Sergeant at Army Terrance Gainer wrote in an email Monday afternoon. “We do not have any information to suggest the Senate, its members or staff are in any danger but out of an abundance of caution, we feel this is the best court of action to keep everyone safe,” Gainer wrote in an email first reported by Buzzfeed’s John Stanton. 1925 GMT: Law enforcement authorities have identified 34-year-old Aaron Alexis of Fort Worth, Texas as a suspect in Monday’s shooting. He was reportedly died during the rampage. DC officials will update the media at around 2000 GMT during the third press conference of the day. 1913 GMT: Senate Majority Leader Harry Reid (D-Nev.) told reporters on Monday afternoon that the Senate is recessing until the next morning. Meanwhile, though, the Senate office buildings are reportedly on lock-down. 1806 GMT: DC Mayor Gray says 12 people are confirmed dead from this morning’s shooting. 1649 GMT: Authorities believe that one shooter is dead and as many as two other suspects are on the loose. Sources speaking to ABC this afternoon said that one of the shooters may be a former Navy official. Meanwhile, the DC Metropolitan Police Department report that at least one of the shooters appeared to be in official military clothing. 1627 GMT: Department of Defense officials tell CNN that they have increased security at the Pentagon following a shooting Monday morning 5 miles away at DC’s Navy Yard. Lanier also said that one suspected shooter is dead and that authorities believe that there are “potentially” two other shooters who have not yet been located. 1606 GMT: Navy officials tell the Associated Press that there are now six confirmed fatalities following Monday’s rampage at Navy Yard, DC. 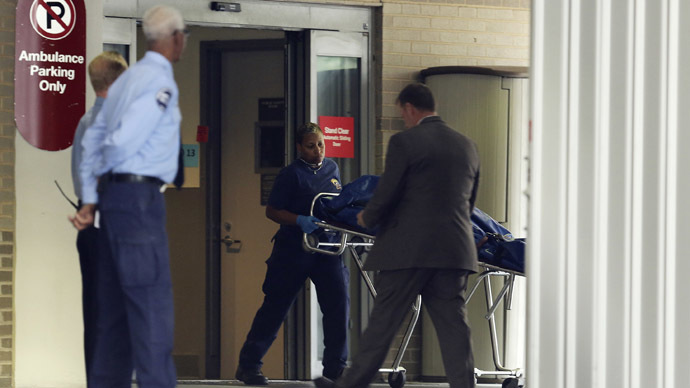 BREAKING: Navy officials say at least 6 dead in Navy Yard shooting. 1538 GMT: Three of the Navy Yard shooting victims are in critical condition but have “very good” chance of surviving, Janis Orlowski, chief medical officer at Washington Hospital Center, tells reporters. The three victims at WHC, Orlowski says, include one male and two females. One has injuries to the legs, another was shot in the shoulder and a third has gunshot wounds to the head and hand. “They do have severe injuries but we have been able to speak to all of them,” she said. There are currently three victims at WHS, but Orlowski says the hospital is expecting more. 1534 GMT: RT’s Sam Sacks reports from Navy Yard that there is “a flurry of activity” as several police cars race around southeast DC near Navy Yard. 1526 GMT: One of the suspected shooters is dead, two different law enforcement sources have confirmed to DC’s NBC affiliate. 1519 GMT: Law enforcement sources tell CNN that the same Bureau of Alcohol, Tobacco, Firearms and Explosives team that assisted with the Boston Marathon bombing have been deployed to Navy Yard. 1513 GMT: Federal Bureau of Investigation sources tell Fox News that an FBI SWAT team is working with other agencies to clear out the building at Navy Yard where at least one shooter is thought to be hiding. 1506 GMT: A representative for the Naval District of Washington Public Affairs office tells reporters that two shooters are “down.” A press conference is scheduled to begin shortly. 1451 GMT: Washington Post is now reporting that two shooters may have been responsible for the Monday morning rampage. Initially the paper reported a lone gunman, then three, opened fire at DC’s Navy Yard. 1444 GMT: Of the 10 people reportedly shot, police say eight are civilians, one is a DC police officer and another is a Navy Yard base officer. 1442 GMT: Two hours after gunshots were first reported, police tell local networks that at least one active shooter is still at large. 1437 GMT: At least six DC-area schools near Navy Yard have been placed on lockdown as a precaution following Monday morning’s shooting. 1430 GMT: Police sources have told the Washington Post that there are at least three shooters are thought to be responsible for the Navy Yard incident. Joint Chiefs of Staff member @CNOGreenert was evacuated from Navy Yard at time of shooting, says Navy spokesman, Navy spokesman says. 1428 GMT: Reagan National Airport in Northern Virginia near downtown DC has been re-opened following a brief closure ordered as a result of the Navy Yard shooting. 1421 GMT: A senior Naval officer has told NBC News that there are multiple shooters responsible for the outburst Monday morning, and that at least four victims are confirmed dead. 1412 GMT: Navy have confirmed that there have been "some fatalities" as result of the shooting. The confirmed number of those wounded has risen to ten. 1408 GMT: Police have closed M Street and 11th Street Bridge by the shipyard due to the incident. A police helicopter has landed on the bridge. 1405 GMT: Police are acting on reports US Navy Yard shooter may have gone on roof.